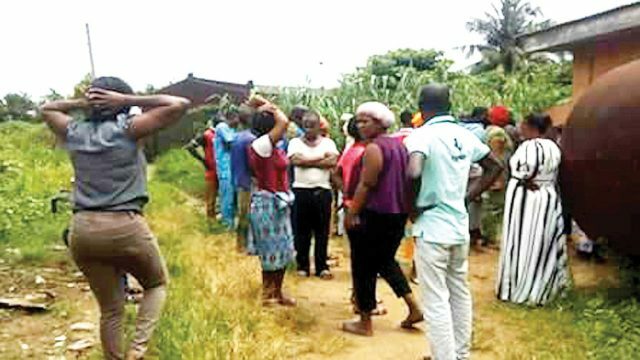 Suspected members of the dreaded ritual gang, Badoo yesterday attacked a family at Lajo in Ibeshe area of Ikorodu, Lagos State. The attack, which was said to have occurred around 3:00a.m., left the man, identified as Shakiru, his wife and six-month-old baby critically injured. The Guardian gathered that an alarm raised by Shakiru’s neighbour attracted the attention of other residents, who immediately launched a manhunt for the suspects. According to a resident, the family was attacked by two men, who gained entry into their home by smashing one of their windows. He added that the community elders immediately notified the local vigilance group and the victims were rushed to the hospital. He said: “The man’s name is Shakiru but he is popularly called Shakur. The two Badoo members attacked his family. They were rushed to the hospital but we later heard the man died. His wife and child are in the hospital. We could not sleep anymore. People were shouting Badoo Badoo and that was how everyone came out to hunt for them. “They were two men. One of them fled into the bush. The other one was not so lucky as he was caught. People descended on him and asked him to mention names of their sponsors. He mentioned one Baba Noah. But when angry youths went to look for the man, he had fled. They wanted to lynch the suspect but the police came to the scene and said they were called by the Baale to take away the suspect. “The police eventually took him away though the mob injured the suspect on the leg. There is tension in the area because residents do not have confidence in the police,” he said. Meanwhile, a gang of daredevil gunmen at the weekend attacked a filling station in Pandogari town of Rafi Local Government Area of Niger State, and abducted the station manager, Malam Muazzam, while killing three persons. Among those killed, according to Suleiman Muhammad, a resident, was one Abubakar, whose wedding is just two weeks away. It was gathered that one of the kidnapped persons was set free when the motorcycle carrying him and one of the abductors developed fault midway around Alawa forest in Shiroro Local Council. Suleiman told The Guardian that the gunmen arrived the filling station shooting sporadically into the air and held sway for more than 30 minutes, adding that policemen attached to the area only arrived at the scene after the gunmen had left. He said the abductors have made contact with community leader and are demanding for N3 million for each of the victims before releasing them. The incident is coming barely a week after three persons were abducted on their way from Alawa market. The abductors demanded N5 million but later accepted N700,000 and released the victims. When contacted the state police command public relations officer, ASP Peter Sunday, confirmed the incident, saying the gunmen were shooting sporadically and that out of the three people hit by bullets, one died, while the remaining two are on admission at a hospital. He also confirmed that three persons were abducted but said one of them was rescued by the police.